Three men are being hailed as heroes after rescuing a blind man who fell onto the train tracks at a Toronto subway station. 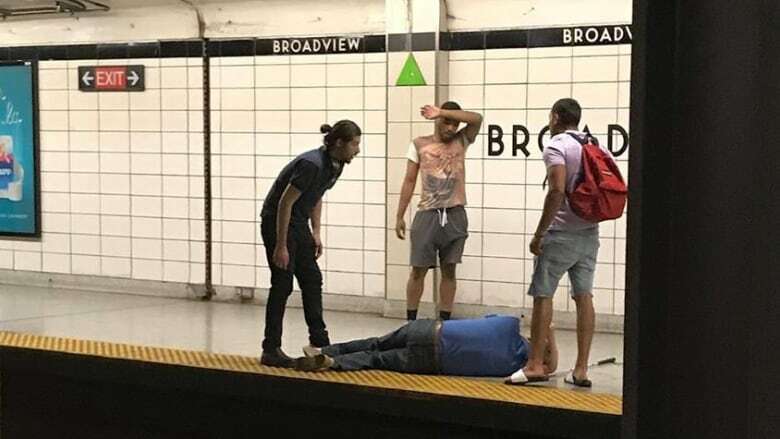 The incident happened at Broadview Station, close to downtown, just before 3 p.m. on Thursday, and nobody was hurt thanks to the trio's quick thinking. One horrified commuter snapped a picture of the moments after the rescue. ​Kyle Busquine, a 24-year-old landscaper, had made an unexpected stop at Broadview due to a train problem. That's when he heard a faint yell. "Help, help, help me," Busquine recalls hearing. "It was very guttural and filled with fear." Looking over the platform, he saw a man and his walking cane on the track. Busquine jumped onto the tracks and two others followed. Together, they hoisted the man onto the platform as fast as they could, worried another train might be coming toward them. "We were all just in shock looking at him, hoping and praying a train wouldn't come," said Julie Caniglia, the commuter who both photographed the rescue and posted about it on social media. "It was probably all within less than a minute but it seemed like hours," she told CBC News. "Knowing that the worst thing possible could happen and it was out of everyone's control was really just the most frightening thing I've ever seen." Caniglia said one of the men, who was on her eastbound train, leapt down and crossed the tracks to get to the westbound platform to help. "There's no way I would've been able to do it by myself, especially without hurting the man any further," Busquine said. After the incident, the Toronto Transit Commission said the man who fell had been waiting for a westbound train when he walked off the edge of the platform. Paramedics took him to hospital, where he was treated for minor injuries. Busquine didn't get the names of the other two men who helped him, but is very grateful for their bravery. "I do want to thank them. They did a great job for coming down and helping out," he said. He's not the only one who wants to say thanks. Caniglia's Facebook post praising Busquine and the other men has been shared over 33,000 times and she, herself, wants them to be recognized. "The gentleman, well, all three of them, but especially [Busquine], I hope that we find him and give him the proper recognition that he needs," Caniglia said. Busquine says he's been overwhelmed by the support he is receiving. "Sometimes you just are where you need to be. I truly think that everything happened for a reason for sure and I'm just happy everything played out how it did. "It was the right thing to do, the human thing to do, to help someone else in need," he said.